Spigot & Socket pipes and accessories are manufactured in accordance with BS 5911. This is the relevant British Standard which sets out the complete specification including manufacturing tolerances and the various strength and hydrostatic tests which the final product must comply with. However it does not include guidelines on the use if pipes for particular situations. For Guidelines on specifying the use of pipes including Diameter, Class, Bedding details etc. refer to Concrete Pipe Systems Association Publications or your engineers details. Loads on Buried pipelines in trenches simplified tables. Hydraulic calculations for sewer and surface water. Laying concrete pipelines in trenches. Below describes the markings which the manufacturer puts on pipes to identify them. BS5911= The British Standard to which the pipe is manufactured. British Kitemark = This indicates that the BS institution, following initial on site tests and continuous site assessments, have been satisfied that the product meets the relevant standard and grant the manufacturer a licence to use the Kitemark on product. There may be other marking on pipes such as colours or batch number which is solely for the manufacturers purposes. Time and place of loading should be agreed before units arrive on site. 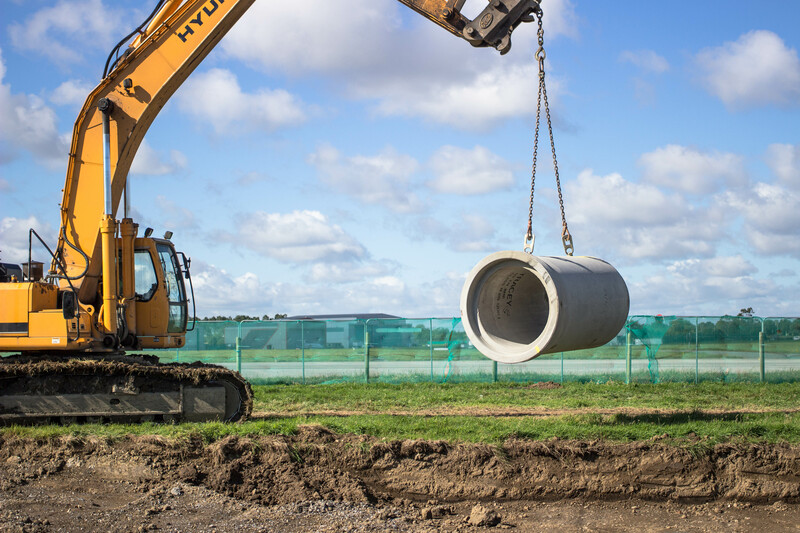 The pipe line contractor should provide suitable equipment for offloading, stacking and stringing out pipes and other accessories on site. Offloading should take place at the nearest hard road to the point of installation provided it is accessible for delivery trucks. All units must be left in a stable condition well clear of the edge of trench. Pipes should be handled horizontally using a properly designed ‘c’ hook or other purpose designed equipment, but not unprotected chains. For safety reasons always know the weight of pipe to be lifted. 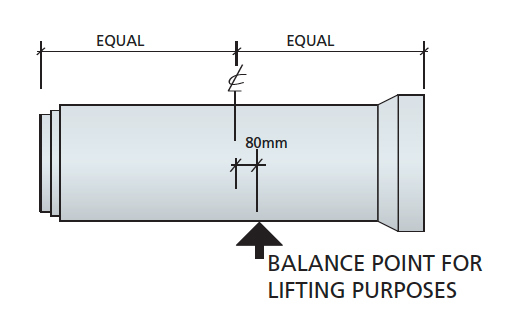 Never Lift pipes or accessories as shown in Fig. 3 which is likely to cause damage to spigot or socket. Where stacking is necessary, this must be on level ground and the bottom layer of pipes securely chocked to prevent pipes from rolling or stack from collapsing. 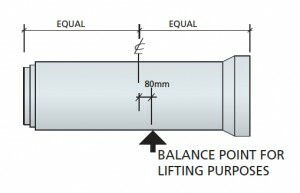 Pipes should be supported under the barrell of the pipe so that the sockets are free from load, they should preferably be stacked barrell to barrell with sockets overhanging alternative sides. Mainly for safety reasons pipes should not be stacked in greater numbers of layers than shown in table. Generally the height of stack should not exceed 2.0m high. Carefully inspect during off loading to verify that products comply with order and are not damaged. If a product fails to meet these conditions notify the company immediately and record details on delivery docket. Pipes or other units which have to be moved, should never be dragged. If pipes have to be rolled, beware of rocks or boulders which may damage joint profiles.